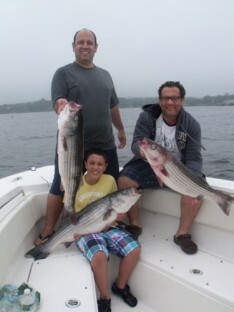 Free Fishing Reports > Northeast > New York > Western Sound > Live Bunker is the Key! Live Bunker is the Key! Joe, Kareem and Hassan got in on an amazing live line bite this morning in the shallow water. The bass were very aggressive today due to all of the bluefish harassing the bunker schools. The bite was non-stop for nearly the entire trip. 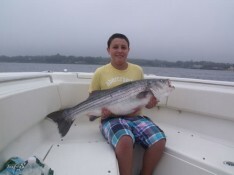 We’ve been seing much bigger bass and bluefish the past few days with today’s biggest hitting 33.